How much is a leader worth? Whatever it takes to get the best available, according to FA chief Brian Barwick. The assumption is that the right leader will make the difference between success and failure. But how rational is this financial market model of leadership? 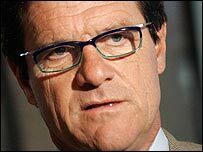 When Fabio Capello was introduced to the media as the new England Football manager and rescuer in chief, The BBC reported the discussion over Capello’s remuneration. As a spiky question flew in about Capello’s reported salary of £4.8m a year, the perspiring FA chief [Brian Barwick] decided to throw himself into the barb’s path. “It’s important to realise that the FA’s gross income in the next four-and-a-half years may well be in excess of a billion pounds,” he trumpeted. “The money is a secondary thing,” added Capello through his interpreter, which is perhaps easy to say when you’re about to trouser £13,150 a day until 2012, with a bonus of £5m if you bring home the World Cup… And what about the arrival of his backroom team of four fellow Italians, who between them will be costing the FA an extra £1.4m a year? Was this not the footballing equivalent of buying an extremely expensive gadget for Christmas, only to unwrap it and find that it won’t work without four additional batteries (not supplied)? So we have a simple equation based on what the market will pay, what an organization can afford, and its estimated costs of success and failure to achieve its objectives. The simplicity of the calculation is one of the attractions of the theory of rational market economics. Unfortunately such simple calculations are almost certainly wrong. Academic attempts to find the relationships between corporate performance and remuneration of chief executives have indicated that the relationship is far from straightforward. There is, for example, differing degrees of ‘stickiness’ between organizations attempting to change things. Football has tended to be at one extreme, with a tendency for managers to be fired perhaps prematurely, rather than too tardily. Other institutions cling on to their leaders after their shortcomings seem to be reflected in performance indicators. For rather obvious reasons, family firms fall into this category. But in any case, the survival or departure of a chief is premised on a belief that any change in fortune will be a direct and simple consequence of a change in leader. That relationship is just too simplistic. Strategy formation and execution have different dynamics, over which a leader has differing kinds of impact. There are several dimensions … that relate to our work on financialization. One of them is the continuous reinvention of banking institutions in a period defined by financial innovation. Morgan Stanley like other investment banks now earn more from using their own capital than their customers. Goldman Sachs [GS] is the leader in this aspect and the likes of Morgan Stanley and Merrill Lynch are the followers. Merrill Lynch lost its CEO trying to be more like GS. Barclays Capital Bob Diamond is another star name with lots of leadership capital who suffered in recent financial crisis. GS and Deutsche so far have come out OK. From our research, we argue that banks have become opaque organizations, which are among the official classification of large complex financial institutions [LCFIs]. These all have interesting implications for the executives of such giant complex organizations, that have government protection in bad times and now are too big to fail. A second stream of our research is executive pay. What determines the high levels of pay? There is no link between performance and pay, almost everyone agrees on this. Pay for failure is accepted and that is an interesting social phenomenon, causing serious deterioration in income distribution taking us back to the early 20th century. In a financialized economy, financial services and related intermediary businesses (law firms, accountancy firms, consultants, etc.) need new deals -structured finance, private equity, securitization, hedge funds, etc.- to derive high fee income and remuneration. There is a large literature on how pay packages are designed to achieve the going rate rather than linking pay to performance. Stan O’Neal’s package when he was forced to leave Merrill Lynch was $160 million, which would pay the salaries of the six members of the Federal Reserve, who are responsible for sorting out the mess created by the likes of Stan O’Neal, for 100 years! [Mervin] King in the UK [head of the Bank of England] gets lots of stick as well, from all corners, because of his lack of leadership skills, but his [low] remuneration has no relation to the [high] responsibilities and the risks he carries. Business elites, and the role of intermediaries in a financialized economy, pose interesting research questions. There’s nothing so practical as a good theory. The English FA took the views of a range of experts into account in arriving at a deal with Mr Capello and his agents. They may have got the right person, at the best rate they could negotiate. But the statement by Mr Barwick suggested they had not been over-influenced by financialization theorists. Within days of Fabio Capello’s appointment as England football manager, the myth-making machines were into full-scale production mode. Strictly speaking, they were mostly engaged in reworking the ideas from an earlier text. The build-up to his appointment was itself conducted with considerable intensity, albeit with a few too many overtones of awaiting the puff of white smoke from the Vatican conclave which would announce the appointment of a new Pope. We learned a lot about his unrivalled success as coach in the largest clubs in the world. We could even see the poke-in goal administered by a youthful Capello against England at Wembley in 1973. The media, and fans appear mostly very positive, although with a minority vehemently holding to the view that ‘The England Coach needs to be English’. I listened to the interview on the morning Sportsview programme. Desailly has a rapid-fire delivery, and delivers his observations with energy and emotion in fluent English. He makes it clear that he has enormous respect for Capello’s virtues as a coach. This is hardly news. There follows that special kind of nurturing to ensure that story takes the required shape. In courtroom dramas, such actons are followed by the objection that counsel is leading the witness. Desailly is pressed to work a little harder.. Doesn’t Capello have any weaknesses? Desailly obligingly tries to be of assistance. Maybe the new coach is not a good listener. Hm, that’s not much of a story either, I thought. I wondered if ‘not listening’ meant not receiving the message, or not taking the views of others into account. I was very shortly more than a bit surprised at the speed with which the replication process was taking place. The leading sports item in the next BBC news bulletin, a few minutes after the interview, was the self-same ‘story’, presented as a kind of mini-exclusive: Capello will have trouble communicating. He is a bad listener. This was later was incorporated into the BBC webpage account of Capello’s appointment. I have several problems with the ‘story’. It is not news. The widely-received story of Capello is that he does not suffer stupidity, including stupid questions from the press. He has been known to ignore such questions (‘not listen’?). He may even walk out, ending such sessions prematurely. Another problem I have with the story is that the sense placed on Desailly’s comments is different when taken out of context, as it has been. My third problem is that the story has been fabricated rather obviously, with the BBC interviewing one of its own, (that’s OK) and then presented the results in a dodgy way and claiming them as an exclusive. (not OK). That’s how news stories are fabricated and replicated. The process followed the pattern at the BBC in the stories involving Robert Peston and Northern Rock, which we reported on in an earlier post. BBC financial expert Robert Peston has an inside track into City chatter. He reports the chatter. Usually with insight and authority. Then the BBC takes its own exclusive story, from its own employee, and makes another story out of it. In the role as celebrity, Peston is now presented as making news rather than reporting on it. This sounds to me rather like The Independent’s stance as ‘a viewspaper not a newspaper’. Maybe that’s what the BBC is also in danger of becoming. You are currently browsing the archives for the Fabio Capello category.